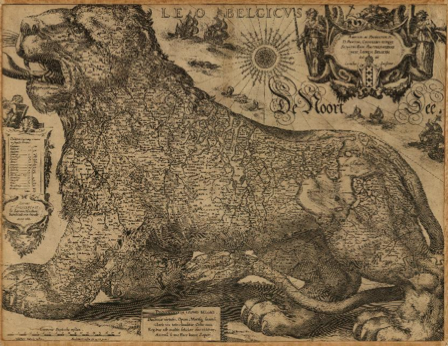 In the history of strange maps, this image of Belgium as a lion, printed in 1611 by cartographer Jodicus Hondius of Amsterdam, is surely a classic. There are many interesting things about it, besides its animal form, the first being that there really was no such entity as Belgium at that time. The Latin term Belgica described the Low Countries in their entirety; that is, the 7 northern provinces that constituted the nascent Dutch Republic (Holland), and the 10 southern provinces (greater Flanders), that were dependencies of the Spanish crown. North and South were bitter rivals then at war with each other over Dutch claims to independence. The so-called Eighty Years War would drag on until 1648; this map was made during a period of relative quietude between the two sides; in 1609, they had signed a truce that guaranteed peace for 12 years. 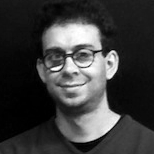 Amsterdam profited greatly by that agreement, and by the war in general, displacing Antwerp as the leading economic center of northern Europe. (Terms of the truce favored Amsterdam.) The pride with which that young city—it was really just inventing itself at the time—is advertised by Hondius is evident in the city shield with the stacked Xs at top right. It's also worth noting the unusual orientation of the map, at least for a modern reader. Here, north is actually to the right, with west at the top of the page. This may seem strange, but from the perspective of someone living in the Low Countries it's actually quite logical, as it places the north sea at top, and so it was common for the time. Amsterdam, however, is rather unfortunately positioned by the lion's hind quarters. Antwerp is more centrally located. If you look closely, you'll also notice many of the cities have little castle icons, indicating they are fortified. Dangerous times.